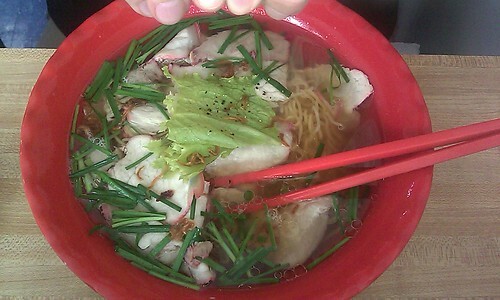 My Tho, located conveniently close to my place of work (and Brian’s place of work also), is where I first tried pho. I was instantly hooked. I’ve been wanting to go but, because Brian doesn’t like the stuff, I haven’t been able to. It feels like it has been a decade since I’ve been to this place. Seriously. Lucky for me, Brian found out that a couple of his coworkers are pho-lovers like myself. Since he was outnumbered three-to-one, he agreed to arrange a trip to My Tho. It’s funny that not much has changed for the restaurant over the last decade. 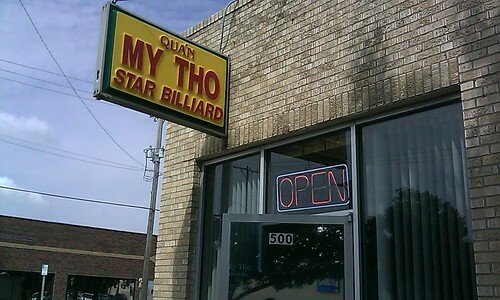 They’re still a cash-only establishment and everything is just as I had remembered, including the billiard tables. Although, they do have menus now and they also serve little sandwiches (which I didn’t remember them offering before). I think when I was there last, they didn’t have any menus and only served pho. So when you go, instead of asking what you’d like to eat, they just ask what kind of pho you want. LOL. But no worries, for those unfamiliar with pho — they do have menus now. I had my usual, plain pho. Rare steak only with no meatballs or other weird meat parts, and no onions. 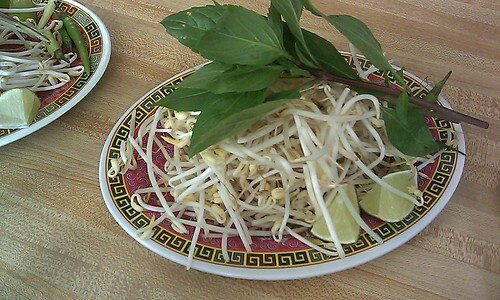 I do like to add some bean sprouts and some leaves to my soup, though. And I like a little bit of lime juice squeezed into it. 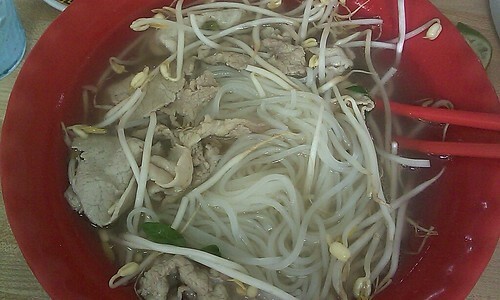 This is what my pho looks like before I add the bean sprouts and leaves with just the beef and rice noodles. I know. Boring, right? But it’s just the way I like it. Brian, who doesn’t like pho at all, had some kind of roast pork sandwich on French bread. Vietnamese sandwiches or bahn mi are supposed to be delicious (or so I’ve heard). They are cheap, too. Brian’s sandwich cost only $2.99 and it was a decent size. Although, Brian’s coworker Alicia said they are not very filling so sometimes you have to ask for two orders. Brian said it wasn’t bad, although it did have a way of cleansing his colon later that day. That reaction could have been caused by that hot sauce stuff that he tried, though. Probably had nothing to do with the sandwich. Blech. I stay away from that hot sauce stuff. Alicia had some kind of combination noodle soup thing with roast pork, which looked to me like the same pork stuff that was in Brian’s sandwich. Her soup, which contains both rice and egg noodles, had more stuff in it so it’s more interesting and colorful. She said that the broth is much more flavorful than regular pho. I didn’t get to try it, though, so I can’t say. If we base it solely off appearance, I would have to agree with her. It looked delicious! Alicia is vegetarian so she didn’t actually eat the pork pieces. I guess she just wanted them floating around in her soup for flavor because she ended up fishing them all out and setting them aside. I didn’t get a picture of Lance’s lunch because he was sitting diagonally from me and I didn’t want to be rude and reach over. He had sandwich similar to Brian’s and some kind of pho or soup thing also. He was dunking his sandwich in his soup a la French dip. It was a little strange to me, but I guess that is how you are supposed to eat it. I am really intrigued about Alicia’s soup thing. I think maybe next (and I’m pretty sure there will be a next time because Brian seemed to like his sandwich thing) that’s what I will get. What about you guys? Ever been to My Tho? What do you normally get there? Which one is your favorite? Or which places do you recommend? This entry was posted on Saturday, September 19th, 2009 at 4:32 pm and is filed under Soups. You can follow any responses to this entry through the RSS 2.0 feed. Both comments and pings are currently closed. My Canh has been a favorite of mine for almost 20 years and it was the owners that were kind enough to educate me in Viet food and culture. 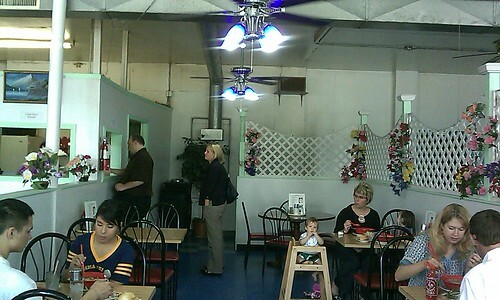 They’ve recently cut the hours that they are open, so check it out for lunch. The bun is fantastic, and the pho and mi is great too. Muy buen artículo. Voy a tener en cuenta la opinión vertida aquí, gracias!